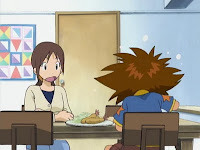 Did Sora's mommy issues sour you to the concept of family problems interfering with the duty of a digidestined? Izzy has a whole different kind of mommy issue, and it sets the bar awfully high. While the episode doesn't add a whole lot to the overall story arc, the unique kind of angst we get out of both Izzy and his mother has to be one of the highlights of the first season. One problem with the way Sora's issues were presented in episode 26 was that we only got one point of view. Sora wanted to play in the big game and Sora's mom said no and now Sora hates everything, Sora, Sora, Sora. It was clear from the get-go that there was another side to the coin and the issue was pretty much resolved when Sora saw it from her mom's perspective. Here, it's a little more complicated as we see things from both Izzy and his mother's point of view. It's a nice little parallel we have going on here that all trails back to Izzy accidentally discovering that he is adopted, while his parents aren't ready to tell him yet. Finally, we get the complete flashback originally teased way back in episode five. I discussed then how Izzy yearns to know more about the world because he knows so little about himself. Now we get the flip side of it. His parents are naturally suspicious of all these shady activities, particularly the locked door. However, Yoshie doesn't want to know more, because she hasn't revealed everything to Izzy yet. Izzy, who was listening in yet again, is stunned when she says he needs to make his own mistakes. This is family tension done right. Long story short, Tentomon's assessment of Yoshie is spot on: she's a great mother, and pretty hot too! Just in case the love, consideration and suppressed distrust in the Izumi household is too fluffy for you, it's contrasted nicely in this episode by the Kamiya household, a completely normal family in seemingly every way. While Izzy trips over himself to compliment his mother's cooking, Tai absolutely gorges on rice, turning to his mother only to ask for another helping. This was before the dub settled on its running gag of Tai's mother (Yuuko!) being a health food junkie. Other than bringing Kari back into the fold, not much is accomplished here. Tai suspects that she could be the eighth child, but she doesn't have a digivice. No... the family cat batted it out the window, where both ended up onto a truck, which crossed paths with Raremon, who tore through a nightclub to get to it. 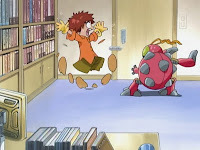 Kabuterimon stopped Raremon, while Izzy and Demidevimon chased after the digivice. Neither were successful as a bird flew off with it. Hence the major wrench both sides have with this eighth child hunt- the beacon leading to her is a small, inanimate object that animals apparently love. Good luck finding her now! Apparently the communicator used by Myotismon and Demidevimon was purchased at Batman's garage sale. I'm confused: was Tai suddenly bursting into tears and hugging his parents some sort of ploy or a genuine show of emotion at being reunited with them after so long? The latter makes more sense, but it's so abrupt and underplayed that it's hard to tell. 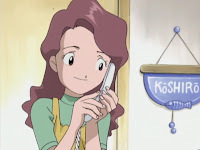 When we first meet Yoshie, it's nice that the animators helped us identify her by putting her right in front of a room with her son's name on the wall- Koushiro. How exactly does Izzy install a lock on his door, a process that would require an electric drill, without his parents finding out? I'm not sure what's used in the Japanese version, but the music piping in during the nightclub sounds an awful lot like Mimi's Japanese image song Itsudemo Aerukara. Gennai installs an analyzer and a radar on Izzy's laptop... along with annoying screensavers? He may be the first elder sage-type to intentionally install malware on an ally's computer. This was a VERY strong episode mainly due to the focus on Tai and Izzy going back home to their families and the parallels the writing draws between them. Tai just spontaneously crying and hugging his mom and dad, whom he was likely unsure he'd ever see again while in the Digital World, is such a beautiful moment. And yes, it was genuine - it being so abrupt is what makes it so believable. Tai wanted to play it cool and make his parents thing everything was normal aside from having to leave camp early, but just seeing his mom and hearing her voice again after what seemed like so long made it impossible for him to hold back his emotions. This is immediately contrasted with Izzy, whose first reaction to seeing his mom again after what seemed like so long is "Hello mother, I'm glad to be back home. Now if you'll excuse me, I'll be in my room." with such artificiality and lack of strong emotional attachment, and it's just brilliant. Izzy knows that his mom and dad aren't his biological parents and have been hiding the truth from him for years, so he feels he can hide from them the fact that he knows the truth and just act like a good little boy in front of them, but he cannot truly hide how distant he's been feeling from them ever since overhearing the secret, making his "good boy" routines come off as insincere and even a bit manipulative. The best part is that he's not remorseless about this - it eats him up inside that he's guilty of treating his parents this way when, the adoption secret aside, they've treated him so well. This really is outstanding writing of family angst, especially for a kids' show. This was our re-introduction to Kari and she's a lot less creepy this time around. She's an interesting and likable enough character, especially in this arc, but unfortunately she's also the weakest developed of the main cast. Not just because she comes in late, but because there's virtually no personality flaws, personal struggles, desires, angst, or depth to be found in her characterization. She's simply the good little girl whose kindness and innocence is oh so pure and that's why she's the child of light and blah blah blah. 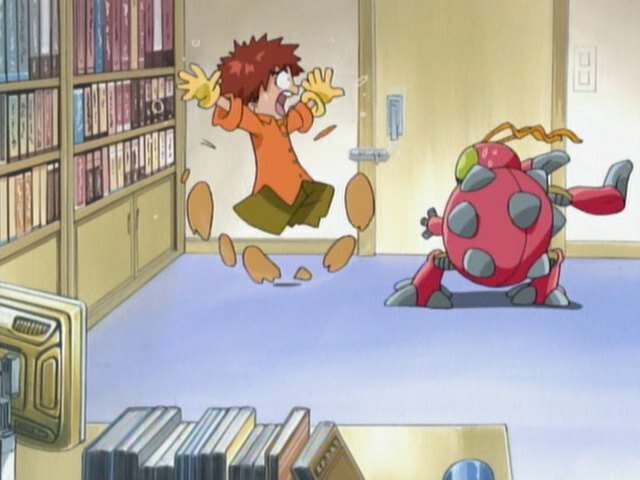 I guess all the really good stuff had to go to the partner Digimon here. I agree this episode is actually really good. Izzys mom is hot btw but tbh' I really wish the other series were more like the first one.